It is extraordinary how apt certain expressions can be in describing the fortunes of particular products, and one came to mind recently when I came across a brand name not seen in Britain for many a year. The expression "What's in a name?" in this instance carries far more depth and meaning than meets the eye. Was this then a revivalist brew by a budding micro brewery keen to see the name once more emblazon our shelves, or had the brewery itself risen from the ashes as a proud name in British brewing heritage? The brewery in question was Watney's, who once, along with such names as Combe's, Meux Reid & Co and Truman's, were one of the leading breweries in the Capital. Founded in 1636, and always associated with The Stag Brewery (firstly in Pimlico and then Mortlake) was, through various acquisitions and mergers to become known as one of the 'Big Six' by the early 1970's. These six breweries combined were determined to change the face of ale production forever in Britain, by phasing out traditional cask ale and replacing it with homogenised 'keg'. The new Watney keg brew 'Red Barrel' formed part of a stridently confident marketing campaign coined the 'Red Revolution'. Their combined actions however led to the formation of one of the most successful consumer revolts of all time - CAMRA (Campaign for Real Ale) and it was Watney's in particular, with their Red Barrel who were singled out as the 'Bete Noire'. Their move to keg had a sound enough basis as it is often forgotten that many cask conditioned beers were either badly made, or kept, (or both) and here at least was offered a stable, uniform, consistent product. Hard to believe now perhaps but the introduction of keg in some towns was greeted with joy in comparison to the locally brewed ales which were so poor - large queues would form outside pubs to taste the new incumbent! 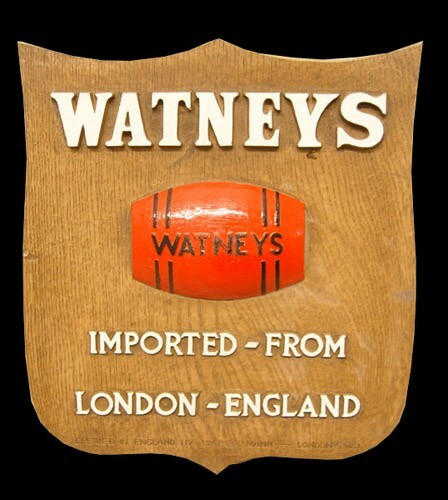 Nevertheless for Watney's in particular it signalled the death knell of their keg product, and their reputation was permanently tarnished. The brewery had fallen from grace, never to recover its status. Curiously this had little to do with the events of the 1970's but born out of a brewing heritage and connection that had began in the early part of the 20th Century. Belgium has a long tradition of producing strong specialist ales, and is renowned for its Trappist beers in particular. Often Belgium beer importers would ask British and Irish breweries to supply their market with stronger versions of their domestic brews, and this developed a keen taste for such ales within the country. These beers would have brewed in their native lands purely for 'Export' and considered to strong for local consumption. Watney's once supplied Belgium with export versions of Red Barrel, Pale Ale, Scotch and Stout, amongst others..
Today the remnants of such brands offer a fascinating insight into a bygone trade link, but as many of the breweries have become extinct, domestic Belgium brewers have adopted some brands as their own. In this instance it is Watneys Scotch Ale which is now the sole survivor of their range. Since 1978 the beer has been brewed by Alken - Maes of Waarloos in Belguim, and maintains the original export strength of 8%Alc/vol. So this then was not a revivalist brew by an English micro brewer, nor an inspirational move to put the name once more in the public domain. It seems that the legacy of past misdemeanour's still haunt the Watney name in the UK, and it may never be able to throw off the shackles. Here then was one revolutionary cause that ultimately was not worth fighting for, with lasting repercussions impossible to foresee at the time.